We’ve all been there: that moment when (after much deliberation) you finally purchase something, only to be left with a guilty knot in your stomach. Maybe that was a bad idea, we think, as the regret seeps in. But (here come the justifications), the item in question was just so cute, you know? And it may change my life. Nevertheless, the icky feeling stays. This phenomenon—formally known as buyer’s remorse—is all too common in our world, whether it’s among us as fashion editors who are constantly ogling new goods, or simply with our shop-happy friends and family. Since nothing is ever as simple as it looks on the surface, we were curious to get to the bottom of why this happens (and how we might avoid it going forward). To do that, we spoke to Art Markman, Ph.D., a professor of psychology and marketing at the University of Texas at Austin and the author of Smart Change: Five Tools to Create New and Sustainable Habits in Yourself and Others. Scroll down to find out what’s REALLY going on when you feel buyer’s remorse! 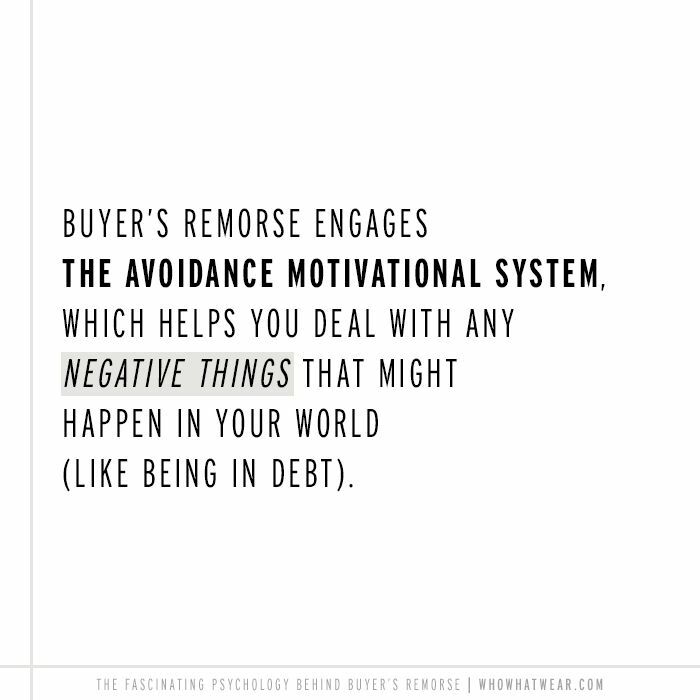 "Emotions like regret and guilt, which you experience with buyer’s remorse, reflect the engagement of the avoidance motivational system. This system helps you deal with any negative things that might happen in your world (such as debt). There is a second motivational system, called the approach system, which focuses on what you desire in the world. "When you shop, you’re often overwhelmed by the approach system. A new pair of shoes, a great dress, or a fantastic top make you think about how much you would like to own them. When you’re governed by approach motivation, your avoidance concerns play little role in the decision-making process." "After you make the purchase, however, the approach motivation system calms down. At that point, avoidance concerns like worries about money can come to the forefront. They are the most frequent cause of buyer's remorse. One way to avoid this phenomenon is to buy things with cash rather than credit cards. That makes the money more tangible and gives your concerns about spending a better chance of having an influence on your purchases." "Another thing you can do is to try to calm the activity of the approach system. One way to do that is to find the objects you want to buy and then to ask the store to hold them for 24 hours. If you still feel you need them a day later, then you can always go back to the store to get them. But, at least you have given yourself a chance to rethink the purchase." "Chances are, if you’re a shopper experiencing buyer's remorse, you’ve felt it in the past as well. If so, then you should work to limit the degree to which your approach motivation will affect the choices you make. The best way to do that is to make a list of the things you need before you go to the store. "In addition, generate a budget for what you can spend before you start shopping. Every time you’re tempted to make a purchase that is not on the list, remind yourself of the impact it will have on your budget. It’s not a foolproof system, but it will minimise the number of times you make purchases that you will later regret." Shop our boutique of elevated basics that you'll never regret buying. Do you ever experience buyer's remorse? Tell us about it in the comments!